I've lost count of all the various ways I kept notes about things. And by that I mean (mostly) digital notes - I'm not a big fan of doing this on paper (hard to search, impossible to change and simply a waste of a precious resource). Historically, the problem had been that things ended up in emails sent to myself, text files, word documents, spreadsheets etc. Nothing that was easy to index, search through and backup. That had to stop, so a few years ago I started looking at note-taking software, like Evernote and OneNote. I didn't want a cloud based solution and, as at that point I was using mainly Windows, I chose OneNote. It allows for local notebooks, but you have the option to upload them to SkyDrive if you want to access them on the web or via your phone. All good. OneNote is a great piece of software (as much as Windows annoys me, I do like post-2007 Microsoft Office). I finally had everything in one place. Was it easily searchable? Nope. The search function was wonky and half of the time it wouldn't find what I was looking for. I could live with it though. It worked well until I went back to using Linux Mint at home (with the necessary evil that Windows is for select games) and realized that OneNote does not play ball with Wine at all. In the meantime I'd been fiddling with Wikis, so I learned how to write stuff using only wiki syntax (very light formatting) and also enjoyed the very convenient revision control that it offered. you get versioning, diff-ing capabilities, distributed backups, etc. install ST, clone the git repository with the config files, install plugins and done. While I still have bits and pieces stored in OneNote, most of the things I do are stored in Markdown formatted files and it's fantastic. Obviously, this is not something your granny could use. It's a solution for power users that have certain expectations from their digital life. A lot of people will be happy with OneNote or EverNote and that's perfectly fine. As a side project, I still need to make this whole solution play nicely with mobile devices (mostly for viewing, not editing) so I can be completely free of OneNote (whose Android app has become surprisingly good lately). Package Control - used to manage all other plugins. Markdown Preview - generates HTML to view in a browser. MarkdownEditing - you can't live without it. MarkdownTOC - generate table of contents based on headings. GitGutter - shows file diffs live in the editor (requires git). ToDone - amazing text todo list, purely syntax-coloring driven. TrailingSpaces - removes whitespace at the end of lines. 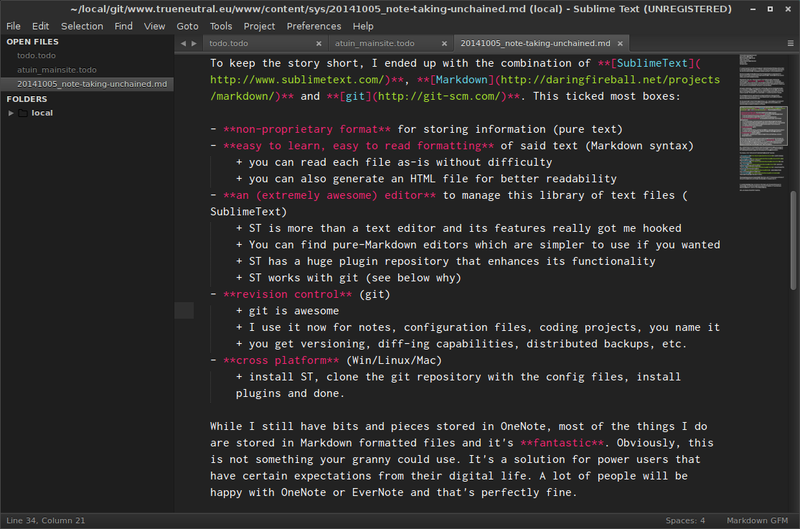 The plugin pages have screenshots of their own, but I'll leave you with one of this article (which is written in Markdown) as it looks in my SublimeText. I could probably write a lot more on the topic, but the point here was to showcase my current solution and give some starting tips. If you have any questions about it, post in the comments below.